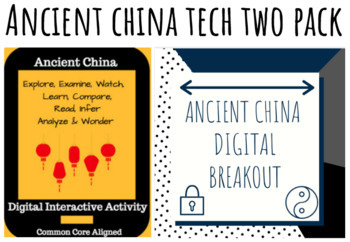 This product includes an Ancient China Digital Breakout and Hyperdoc. Also sold separately. 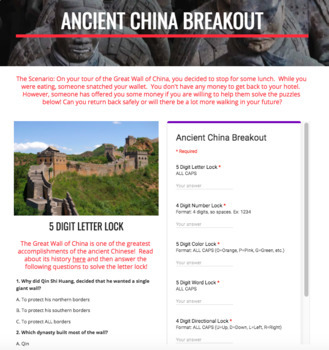 Looking for a digital breakout covering Ancient China? If so, then this is the document for you! All you need is connection to the internet! This breakout is on a Google site. On your tour of the Great Wall of China, you decided to stop for some lunch. While you were eating, someone snatched your wallet. You don't have any money to get back to your hotel. However, someone has offered you some money if you are willing to help them solve the puzzles below! Can you return back safely or will there be a lot more walking in your future? Answer Key Included! 60 min time limit is suggested. You may also be interested in my Early Humans Breakout, Ancient Egypt Breakout, Ancient India Breakout, Ancient Greece Breakout, Ancient Rome Breakout, or Mesopotamia Breakout. Are you looking for a way to make a topic more engaging, technological, and interactive? Well, then this is the product for you! 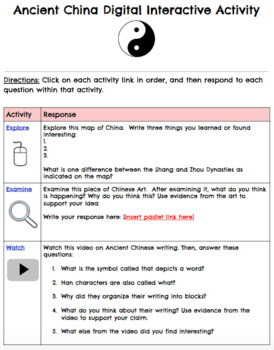 100% digital, this doc can be used to introduce or reinforce the study of Ancient China. Product includes the link to the doc. Must have internet access. Doc is web-based. Video link is from YouTube. It may be blocked by school filter. If so, show the video whole class. You may need to create a Padlet, FlipGrid and Answer Garden link for a few of the activities. Some activities may require Adobe flash. Be sure your school district gives students access to documents from outside of your school district. 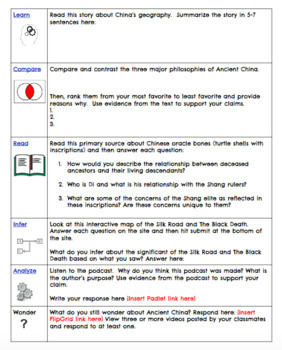 Part of my Ancient China Hyperdoc and Choice Board Two Pack.